You might be too old to trick or treat, but Halloween doesn’t have to include dressing up and going to a party. Don’t be afraid to try something new this year. Consider taking a trip to celebrate the season. Get lost for hours in the Corn Maze. Cool Patch Pumpkins, in Dixon, California boasts one of the world’s largest corn mazes. This year’s corn patch will be over 60 acres – with twist and turns that will keep you guessing for the one to two hours it takes to navigate. Word has it (from my son) that the earlier in the season you go, the better. The corn stalks get tramped on, and sometimes the markers are difficult to see. The pumpkin patch has any type of pumpkin you could desire – different shapes and varieties. You’ll be able to find something to make that perfect jack-o-lantern. The Kid Zone has a miniature corn maze, a straw mountain, and bikes and carts. End your visit with a hayride. Watch out for the scary clowns at Cutting Edge. You can find haunted houses in almost any city for Halloween. Personally, I’m not a fan. But for those of you who are, consider the Cutting Edge Haunted House in Fort Worth, Texas. Guinness World records named Cutting Edge the world’s longest walk through haunted house. It is appropriately located in a 100 year old abandoned meatpacking plant. Much of the original equipment remains. Very realistic mannequins are used in the “processing” During your 55 minute tour, expect to see many of the over 100 cast members. Not in the Dallas area, but still want a scare? Check out Hauntworld to find haunted houses throughout the world. Want to spend Halloween with over 8,000 dead people? 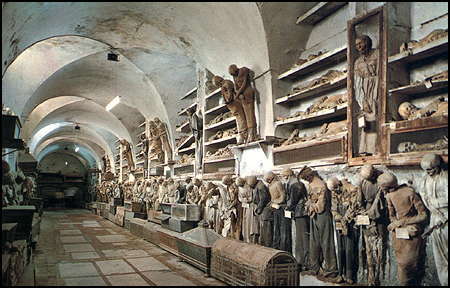 Visit the Catacombe Dei Cappuccini in Palermo, Italy. Originally, only friars and nuns were interred there. But locals wanted to be able to “visit” their departed families, and for a fee, others could find their final resting place here. Soldiers were dressed in full military regalia, and others in their finest clothing. If you’re so inclined, you can compare the various methods of preserving the bodies – dehydration, dipping the deceased in arsenic, or good old fashioned embalming. Be prepared to see skeletons and bodies that have been rather well preserved. Celebrate Dia De los Muertos (Day of the Dead) in Oaxaca, Mexico. While we may think celebrating death is a bit macabre, it is meant as a show or love and respect for the deceased, who are believed to return each year to visit their families to celebrate. Families build altars for the deceased, complete with flowers and food. There are parades as well. Families visit cemetaries not only to clean the graves of the departed, but also to “visit” throughout the night with the departed. This is not a somber occasion; there is music and story telling. Vendors sell sugar skulls and pan de los muertos (bread of the dead). Are you willing to stay in a room where things go bump in the night? Stephen King took his inspiration for The Shining from the Stanley Hotel in Estes Park, Colorado. Ghosts of housekeepers past are said to visit guests, particularly those staying on the 4th floor. The hotel celebrates its paranormal history with tours, murder mystery dinners , a “Shining” Ball and a Masquerade Ball on Halloween night. Have you never seen The Shining? No problem – the Stanley shows it 24 hours a day – enough to give even the most intrepid cause to pause. The zombies are hungry. Are you? Halloween Horror Nights at Universal Studios (Orlando, Hollywood and Singapore) each offer multiple haunted houses, frightening street experiences and spine chilling live shows. Some of this years haunted houses include Dollhouse of the Dammed, From Dusk Till Dawn, and Roanoke – Cannibal Colony. Are you willing to walk through the Bayou of Blood or MASKerade: Unstitched? There will be no break in your adrenaline rush when you ride Revenge of the Mummy. If the thrills become a bit much, you can enjoy doing the Time Warp in a Rocky Horror Picture Show tribute.